We’ve seen a whole lot of resin and stabilized wood products lately, and they usually cost a pretty penny. 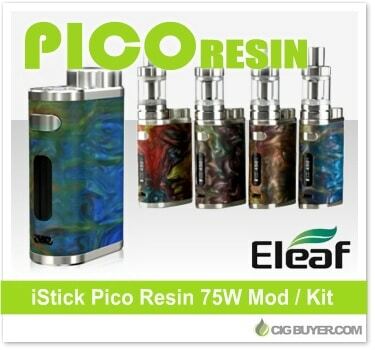 Well Eleaf has take their beloved iStick Pico Mod and created a resin version that’s still relatively affordable. Functioning almost exactly like the original, the Eleaf iStick Pico Resin Mod offers up to 75W of output with temperature control (Ni/Ti/SS) and three memory TCR. Powered by a single 18650 battery, it’s super compact, performs exceptionally well and is sold alone or as a complete kit with the 2ml Eleaf Melo III Mini Tank.